Swedish Dagens Nyheter have a video interview with Christian von Koenigsegg about the new Koenigsegg CCXR. The most interesting part of the interview was when Mr K spoke about the bioethanol car’s performance. He explained that the acceleration is not improved by the extra 200 odd bhp over the CCX, because the car isn’t able to sink the power into the road. However, the top speed he said was calculated to en bra bit över 400 , which means quite a way above 400 (kph). (400 kph = 249 mph). I do wonder what quite a way is here… The Koenigsegg CCXR fact sheet only says the top speed is 400+ kph. And I’d say the chances of VW (Bugatti) letting Koenigsegg have a go at their Ehra-Lessien test track (see it on Google Maps) are slim. I’m working with Roberto de Amorim on a redesign of rarewares.org. 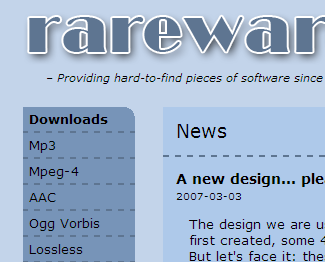 Rarewares is a great website with all thinkable music encoders and decoders. For instance, if you want the latest and greatest versions of Oggenc or Lame, rarewares is the place to go. If you don’t know what Oggenc or Lame are, I’d consider that a sign of sanity. Anyway, they are what you use to compress music to Oggs or MP3s. The main reason for the redesign is that the rare wares aren’t quite so rare any more. The download pages are getting very long and crowded, so Roberto wants to divide them into different sub categories. I’ve put a preliminary version of the new front page on my server. We’re thinking of trying a different colour scheme, and possibly a few other changes, before we make all the content pages. 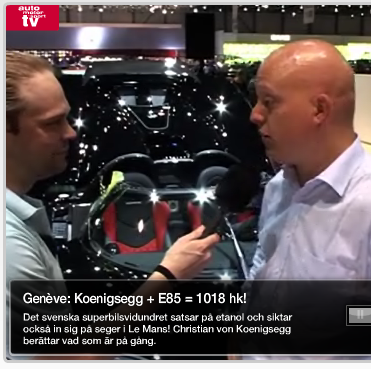 Swedish Auto Motor & Sport today published a video interview with Christian von Koenigsegg. Why can’t he just give us the numbers?! 😀 I guess what everyone really wants to know is – will it beat the Veyron’s top speed? He also says that the car will run on both E85 (85% ethanol, 15% petrol) or normal petrol, which was new to me, and that they’re hoping to race the Koenigsegg CCGT in Le Mans, if they manage to qualify. If you didn’t know, Mozilla Links is the name of a brilliant new Mozilla news site. They update often, with articles on stuff that happens on the Mozilla scene. Percy Cabello, who runs Mozilla Links, also writes reviews of interesting Firefox extensions and posts useful tips and tricks. MozillaZine was for a long time the one-and-only website for Mozilla-related news. But around at the same time as they introduced the ads, things started to go downhill. Now I feel that anything I read on MozillaZine I have already read somewhere else. And the comments after the articles are seldom very lively nowadays. (Perhaps because we don’t get the bimonthly name-changes for the Mozilla products any more…) I don’t actually think that the change has anything to do with the ads though. In fact, I’m not even sure that MozillaZine really has changed. It could just be that my news-gathering patterns have changed. I (obviously?) read many more blogs now than I did a couple of years back. 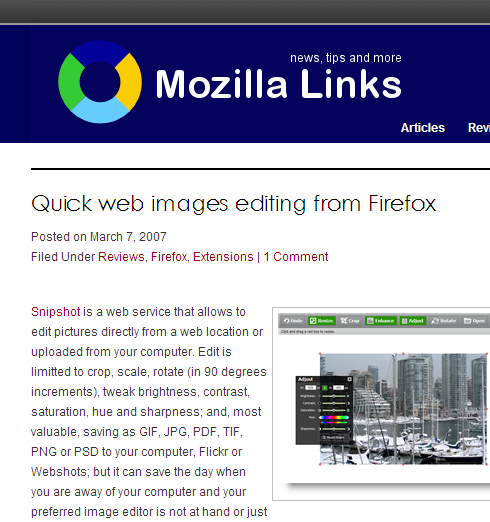 Anyway, for the Firefox aficionados, Mozilla Links is a great resource. Don’t forget to add it to your RSS readers.